After the grueling drive of almost 6 hours (you can have a feel of it from my previous post) we reached Hospet. 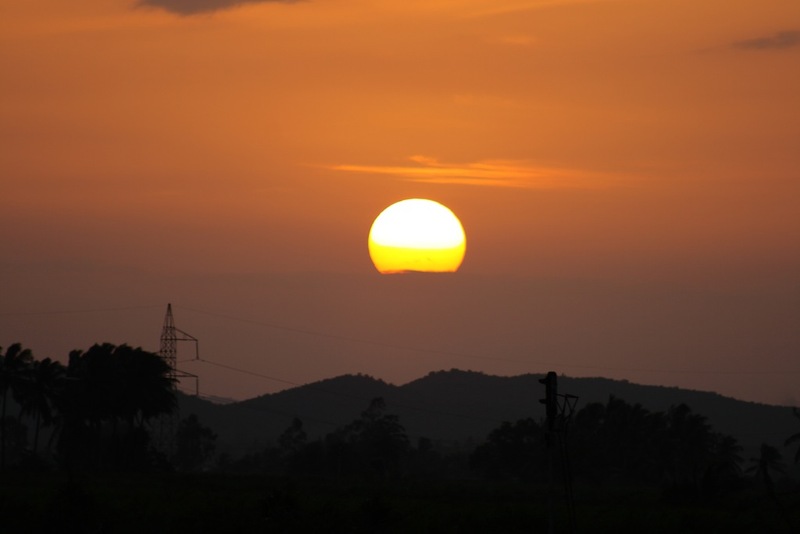 Hospet has many good places to stay. We picked up one that had a good parking place. 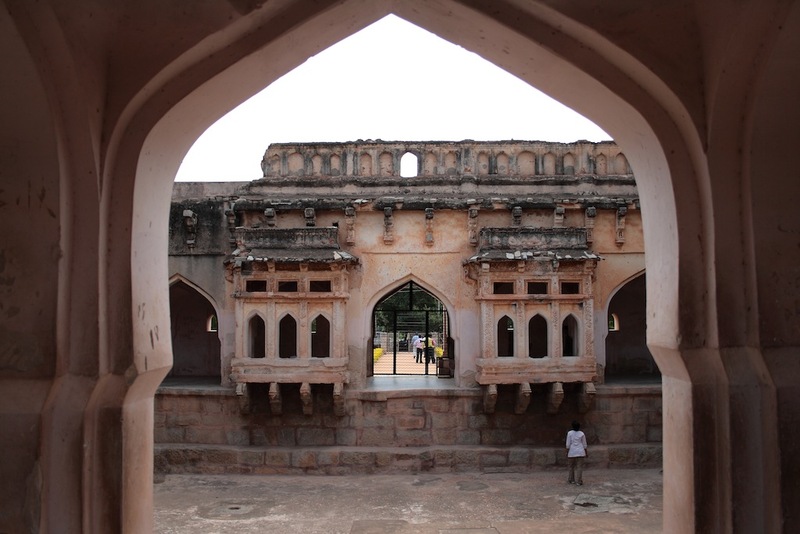 Hospet is known primarily for the Hampi ruins. But it also is home to a dam over the Tungabhadra river that passes near it. Since they have perennial source of water, dams are ideal places for gardens. And the Tungabhadra river dam was no exception. We spent the evening at the dam lazing around in the garden. 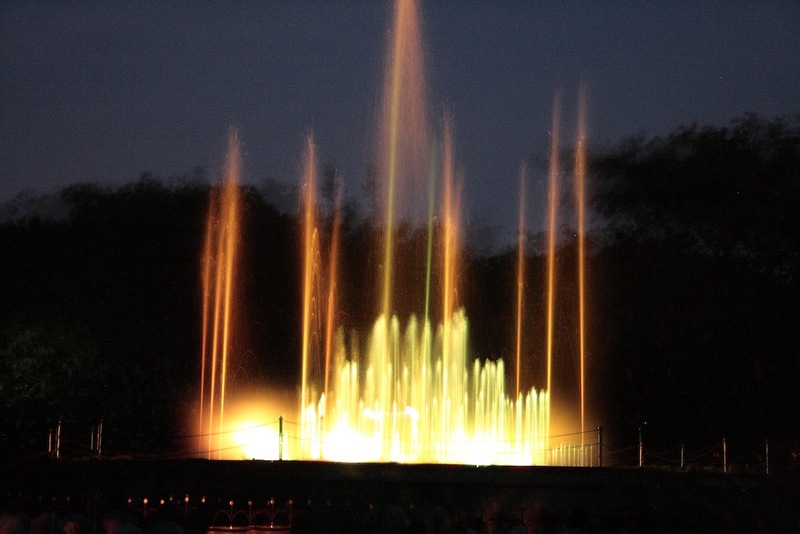 Later in the evening they had a nice show of musical dancing fountains - where they synchronize the water of fountains to music and colorful lights. 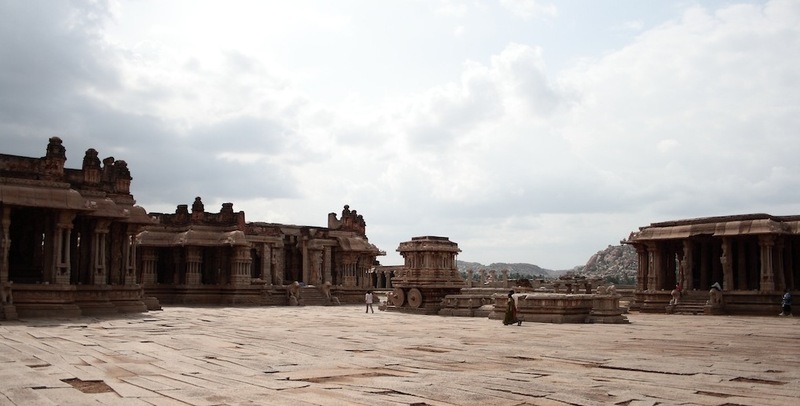 Hampi was the capital of the mighty Vijayanagara empire for around 200 years (1336-1565 AD). Apart from being the seat of political and military power, it was also a major trading center and the culturally happening place of the empire. 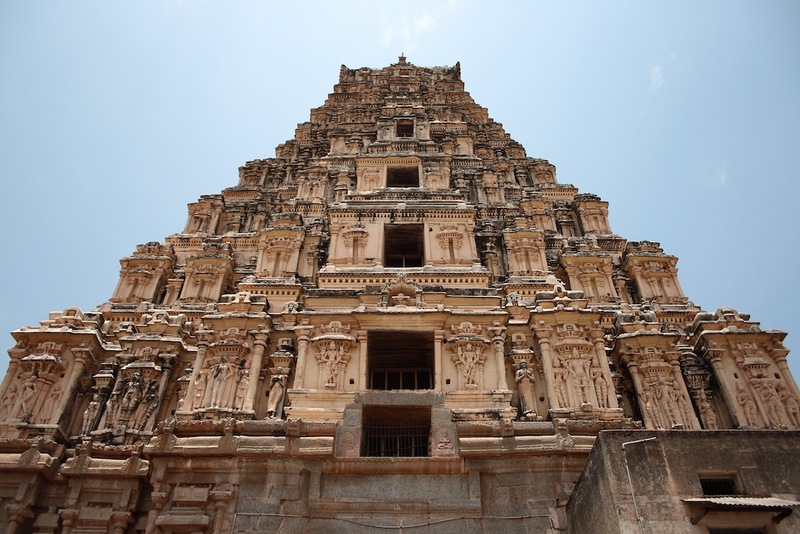 Hampi saw its peak during the reign of King Krishnadeva Raya (1509-1529 AD). 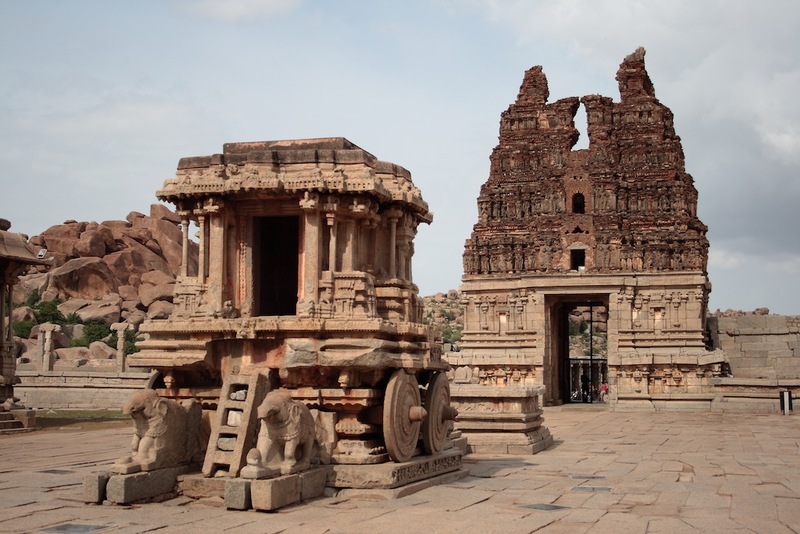 After Vijayanagara's defeat in the hands of the Deccan sultanates, Hampi was looted and suffered major destruction. It was abandoned and the area remained forested and unexplored till it was uncovered again by the curious colonial explorers and historians during the 1800s and 1900s. There is a part of the ruins on the other side of the Tungabhadra river (coracles and boats available for crossing). 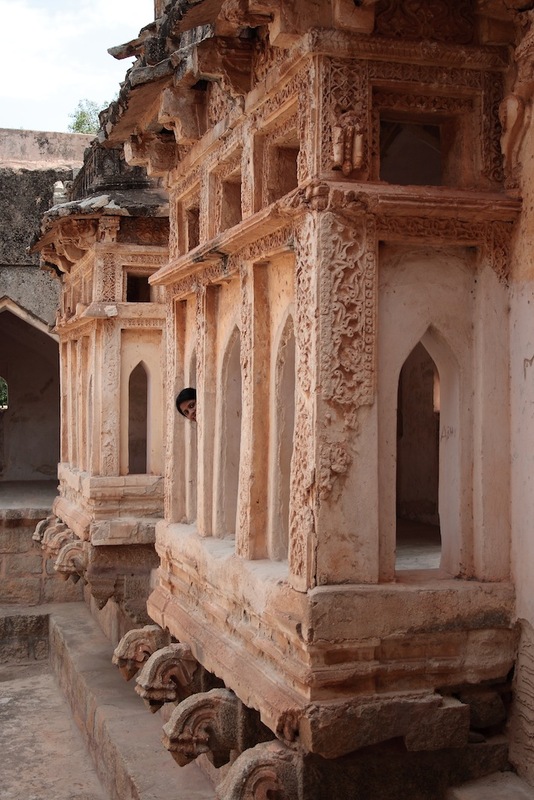 As you must have guessed, a quick tour of Hampi would comprise of a day of concentrated visit to each zone. I'll mention few of the prominent/interesting places here, but my writing will in no way be complete. Some of the description text below are taken from the ASI boards outside the respective structures. The Krishna temple is large, ornate and east facing. It was consecrated with an icon of Balakrishna (the child Krishna) in 1513 AD which was brought from Udayagiri of Kalinga (present day Orissa) after Krishnadeva Raya's war against Kalinga. The temple compound has many small shrines apart from the main shrine. 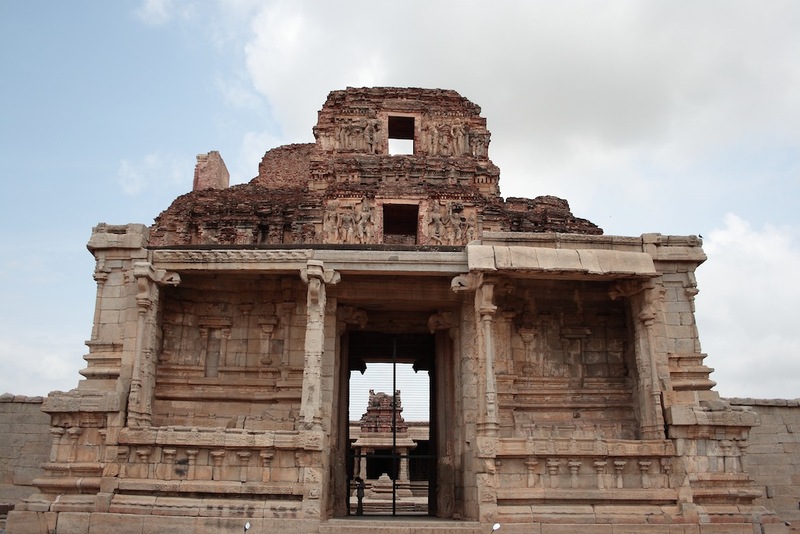 The grand standing eastern gate is an outstanding example of Vijayanagara architecture. The temple walls have carved depictions of the Bhagabata. The pillars of the mahamandap have depictions of the ten incarnations of Lord Vishnu. Just in front of the eastern gate of the Krishna temple there are rows of narrow shelters typical of a marketplace. A little further down is a big water resorvoir with shelters built around it. 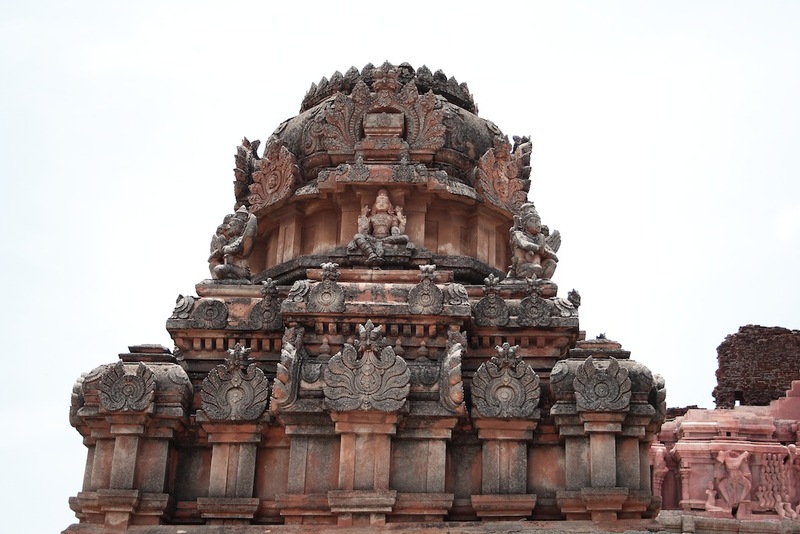 This is the temple of Virupaksha or Pampapati - the guardian deity of the Vijayanagara kingdom. The temple was built initially as a modest structure, but grew to its present (huge) proportions under the patronage of various kings. It has some wonderful ceiling paintings. It is interesting that a narrow channel of the Tungabhadra river flows through the temple terrace and passes through the temple kitchen before flowing out. The temple overlooks the Hampi bazaar. This was the most prominent and important thoroughfare during earlier times. Today the Hampi bazaar is lined with shops selling trinkets and food. 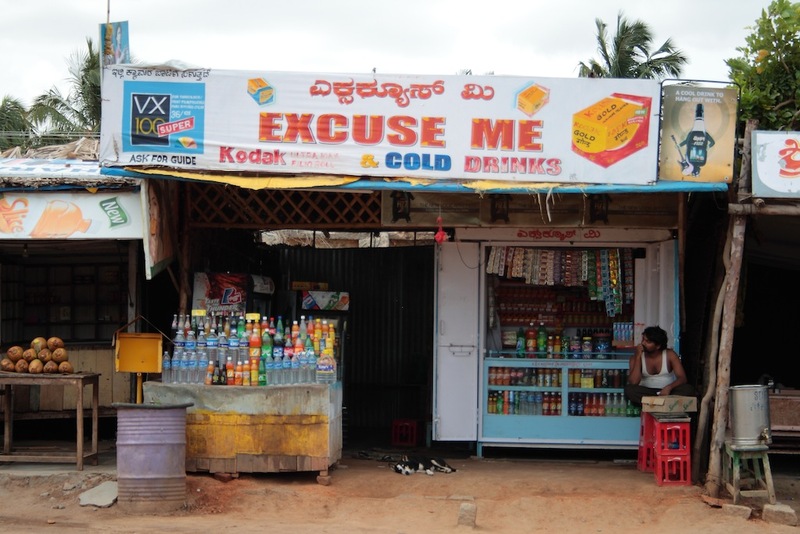 Many shops have some very interesting names - like the one we saw that was named 'Excuse Me'. Vitthala is another name for Lord Krishna. 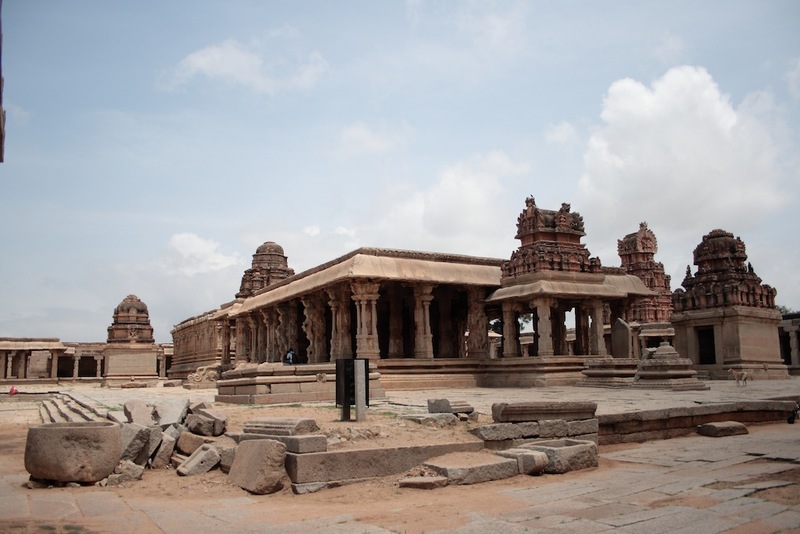 The Vitthala temple represents the highest level of Vijayanagara empire's art and architecture. 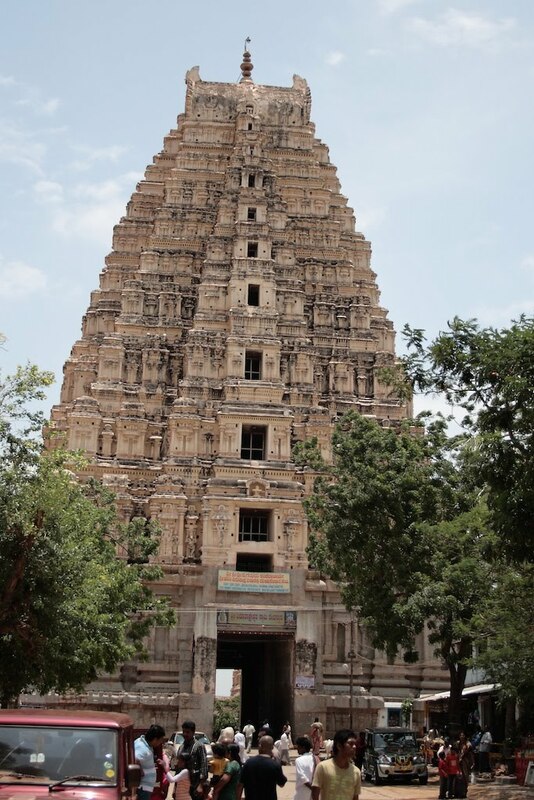 It is one of the largest temples build around that period - 1422-1529 AD. And it has one of the most beautiful creations of that period - the stone chariot, which has become the icon of today's Karnataka. The temple itself is built on an ornate plinth with slender stone pillars. The stone pillars produce pleasing sounds when tapped gently. Outside the Vitthala temple is... guess what... yes! another huge bazaar. It was typical of those periods to have the market place close to temples since the temples were probably the center of all social activities. This temple lies within the royal enclosure and served as the private temple of the royal family. 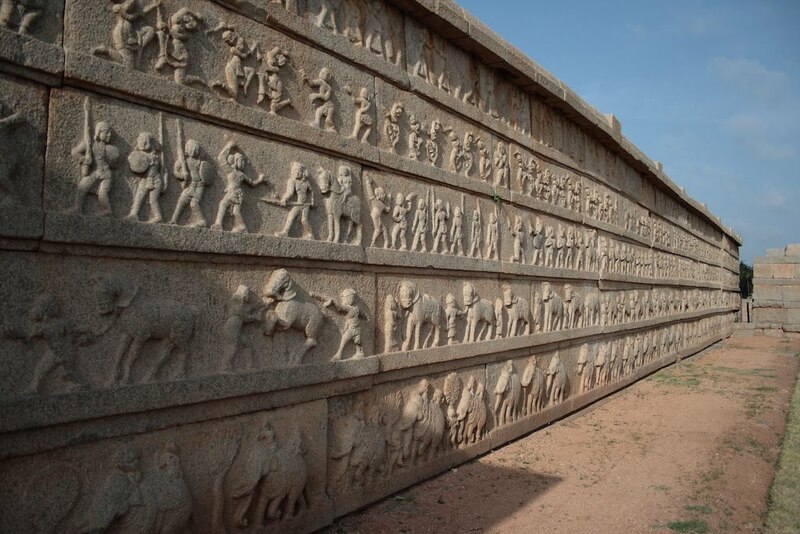 It has beautiful carved strips of figures depicting scenes from the epic Ramayana. Hence the name Hazararama (a thousand Ramas). Though this is called the queen’s bath, but in all probability this was a royal pleasure complex for the king and his wives. The whole building has a veranda around the inside edges facing a big open pond at the middle. Projecting into the pond are many ornate balconies with tiny windows and supported by lotus bud tipped brackets below them. An aqueduct that probably carried water into the pond terminates at one of the edges. The whole pool is open to the sky, but there was probably a canopy fixed on top in those times. At one end of the veranda you can see a flight of steps giving access to the pool. Imagine the place with fragrant flowers and perfumed water and you can realize the luxury that the kings of yore had. Talking of baths, there is also an octagonal bath located nearby. Though similar in size to the queens bath, it is not as ornate. 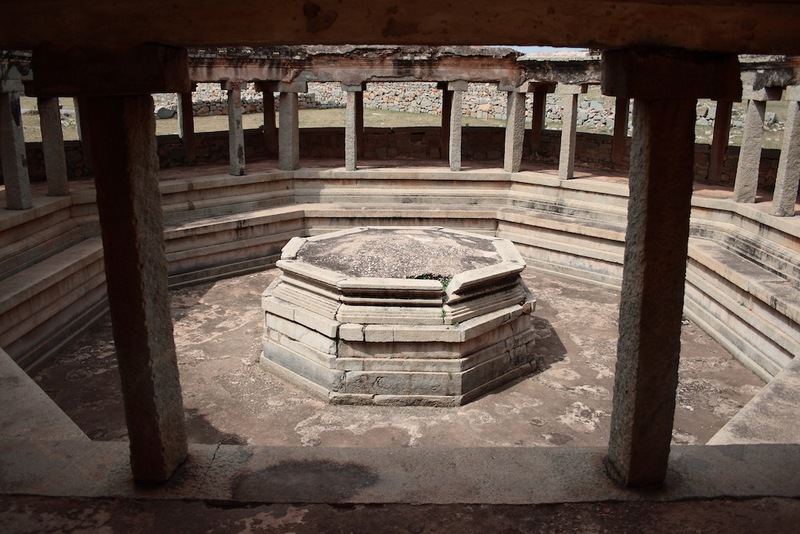 At the center of the bath is an octagonal platform which probably was used as a sitting place. These guys really knew how to make grand swimming pools. With water from the Tungabhadra available in plenty, they must be having a ball of time round the year. What can be seen is the frame of the balance that was used to weigh the king against precious items like gold and jewels. This was typically done during festivals and special occasions and the gold and jewels thus weighed were distributed among the poor or religious people. This was a fortified area that housed the royal family and the people who served them directly. Nearby were important official buildings like the mint, the Zanana enclosure and the Hazararama temple which was the royal family's private temple. Most of the royal enclosure has been completely ruined. Among the few that are still standing, the Mahanavami Dibba is the most majestic. It is a huge decorated platform with carvings along the wall. This was used as a platform to watch celebrations and performances. The view from the top gives a birds eye perspective of the layout of the enclosure. There are also quite a few water bodies in the enclosure, including a beautiful stepped tank. A network of aqueducts, the remnants of which can still be seen, were used to channel water into them. Near to the royal enclosure, this was another secluded enclosure for the royal women. 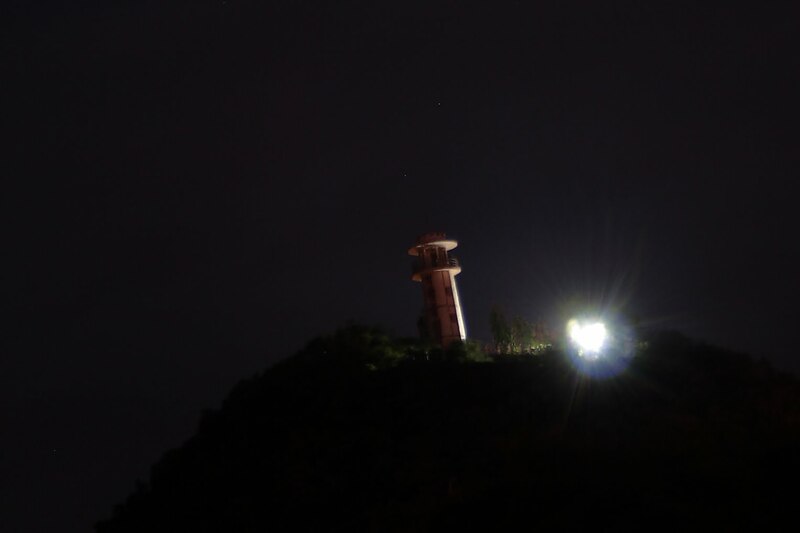 It had high boundary walls and was guarded by guards on watch towers at every corner of the enclosure. Nothing much remains of the queen's palace and other structures inside the enclosure. They were probably more intricately decorated and hence made of softer materials like wood which disintegrated easily. 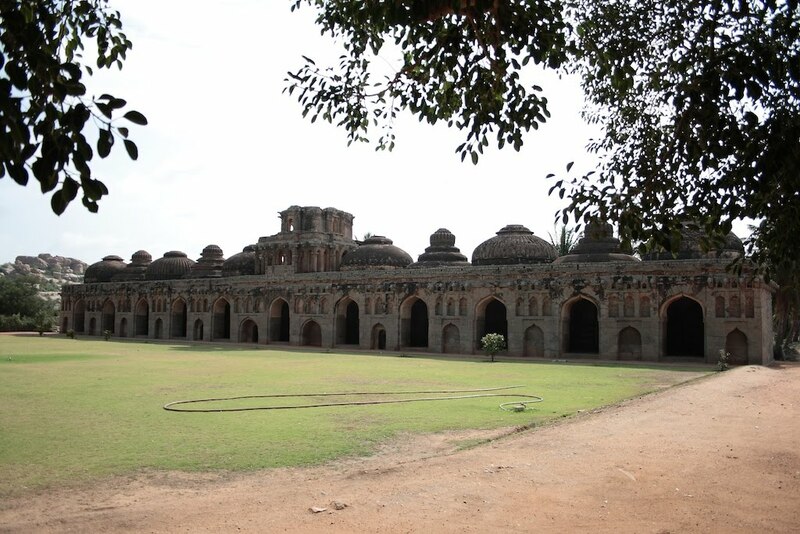 Located inside the Zenana enclosure at Hampi, this is a fine example of indo-islamic architecture. It was probably a place of socializing used by the royal ladies. Unlike most other structures of Hampi, this was made out of bricks and lime plaster that gave its walls a smooth texture. 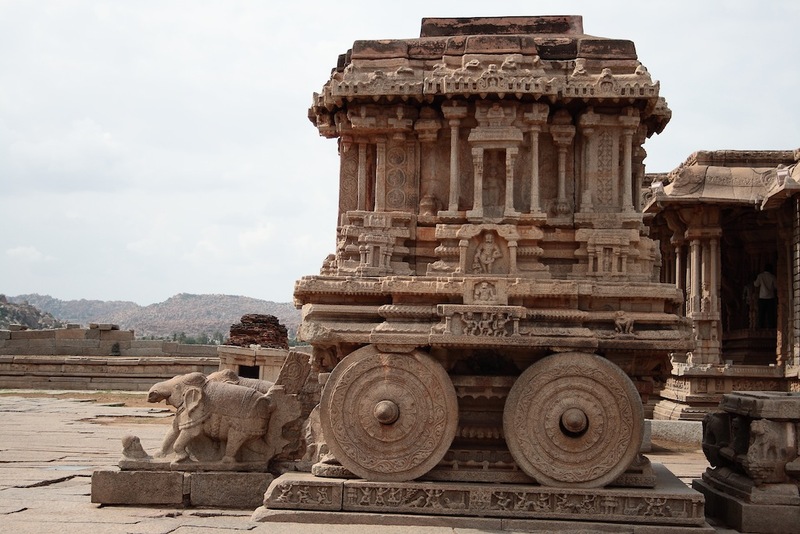 And it was surprisingly not damaged during the seize of Hampi. This structure, near the Zanana enclosure was used to house the royal elephants. It has a row of domed enclosures. Some of them are interconnected and some have a small hole at the back for people to enter. 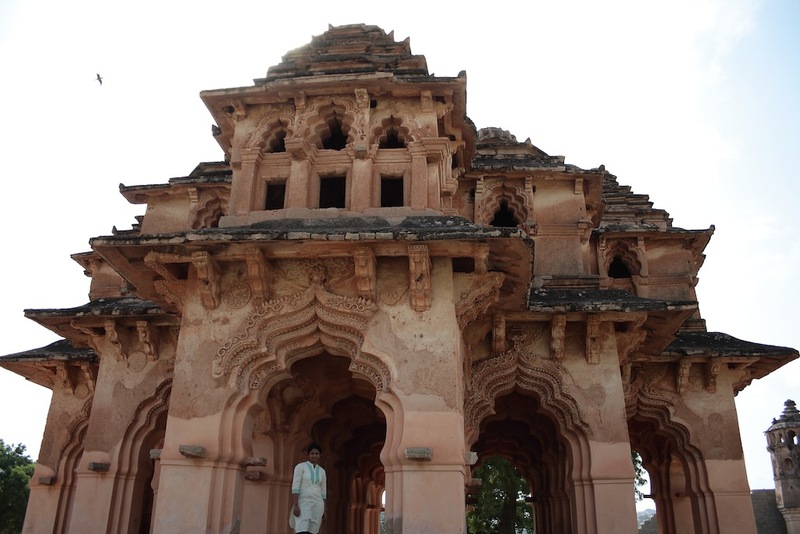 This is one of the least damaged structures of Hampi. There is an expansive lawn in front of the stables, which was probably used as a ground for training elephants or elephant processions. Our Hampi trip was pretty intense. 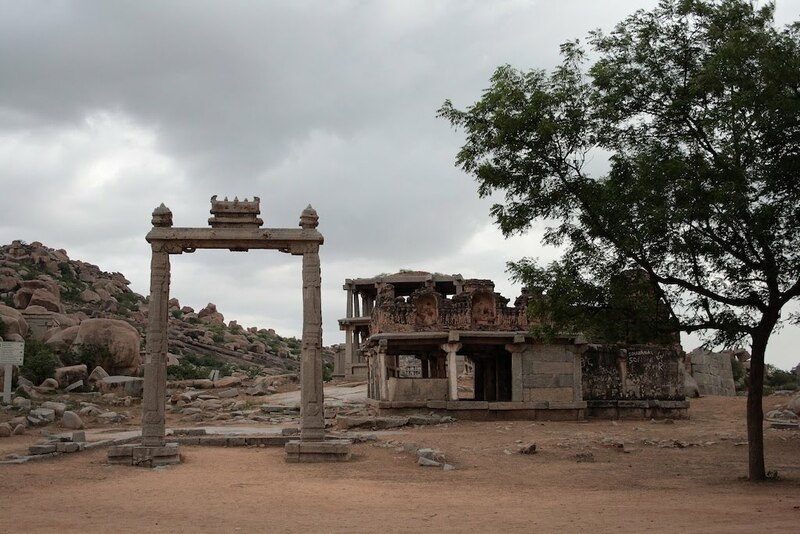 Hampi has been a much promoted tourist place and has been extensively researched and written about in recent times. It is still being excavated in some places. This was my second visit to the place in a span of around 8 years. Today's Hampi is much more tourist friendly than it was 8 years back. Places and roads are well marked. Restoration work can be seen being done actively. Our two days of stay was more for relaxation. 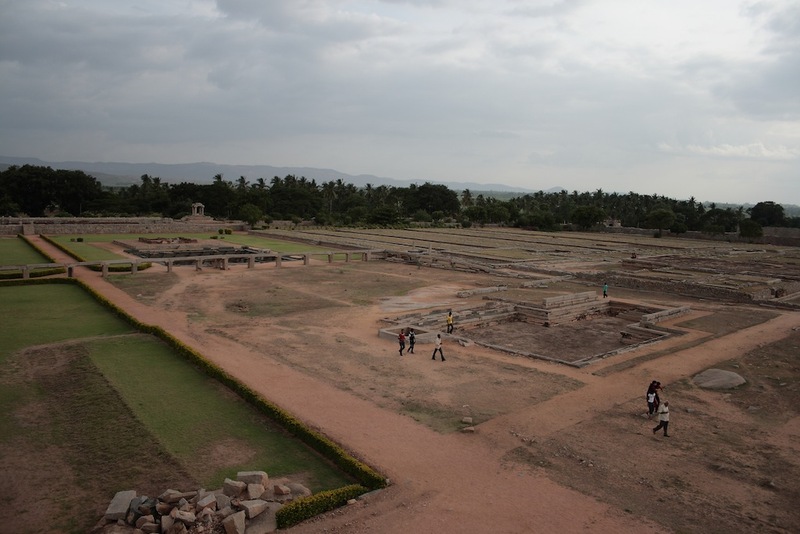 If interested, one can easily spend a week at Hampi, and soak oneself in the past. The best time to visit is during the winter months when it will be easier to walk around. 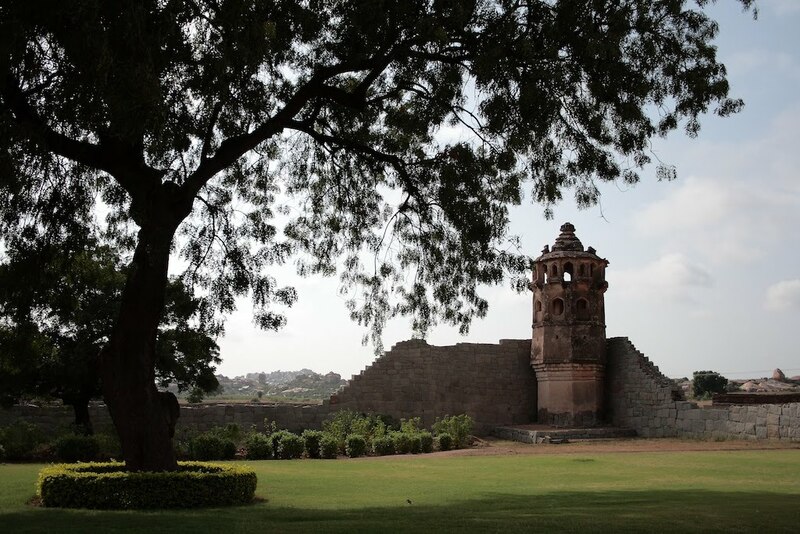 Our next stop was Bellary to visit the Bellary fort. We start off for Bellary next day after breakfast. More on that in the next post. Hampi is a special place indeed. Thanks Madhu for dropping by. It's good to find like minded people around. Just visited your travel blog... amazingly motivating. So, where are you guys traveling now/next? Nice description of Hampi and its historical features, one thing you have missed out is that it was the biggest diamonds and gems trading centre in the world during vijaynagar era. Orient BlackSwan Private Limited seeks permission for material for which we believe you hold the rights. We request non-exclusive English language rights. The textbook has been tentatively priced at INR 90 in order to be affordable to students. We would be extremely grateful if you were to consider a nominal fee, if not a fee waiver in granting us permission, as this is a low-priced textbook made available only to students in small towns and cities. Hope the details help and we hear back from you soon. happy to hear that you are using material from my article in the book. If the material used is limited to the quoted text mentioned in your message, please go ahead and use it. But if it is anything different or includes photographs from this article, please let me know at my email id: wind4wings_at_gmail_dot_com. Thank you so much for granting us the permissions.